Lake Chelan is one of my favorite Washington wine destinations. It is a (relatively) short drive from Seattle to reach Chelan and the bevy of vineyards and wineries that surround one of the deepest lakes in the world. I visited Lake Chelan for the Winterfest and Wine Walk festivities and was able to spend some time with Julie Pitinger from Karma Vineyards learning about their vineyard and wine making philosophy. 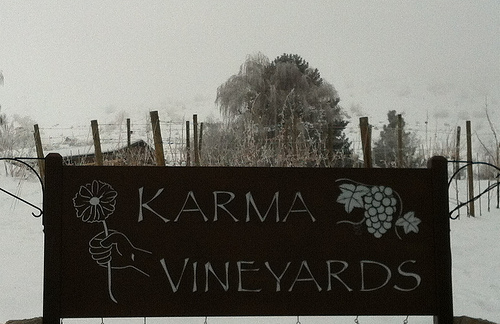 There is plenty of good karma going on with Julie as well as her Karma vineyard and winery. Karma has a unique focus on making sparkling wines. There are a number of wineries in Washington that make sparkling wines. However, Karma is one of the few that follow the Methode Champenoise style that relies on secondary fermentation to introduce the bubbles that make the wines sparkle. It all began about 13 years ago when Julie and her husband were looking for a change in their family’s lifestyle. They wanted to get more exposure to viticulture and build a connection with the land. Their original mission was to find and purchase an orchard. Thanksgiving 2002 found them staying at Wapato point and exploring the surrounding area. Instead of finding an orchard, Julie and her husband discovered a vineyard. Julie says that the place “just felt right” the first time that she saw it. The choice to go from orchard to vineyard seemed absolutely natural. Karma. The first vintage from Karma Julie sold all her grapes to other winemakers. The next year she thought “Hey, I can do this too” and that started her adventure into making sparkling wines. Not just any sparkling wines, though. Julie is from Montreal and her French background lead her to following the Methode Champenoise style for making sparkling wine. Even though the traditional method of wine making is much more labor intensive than others, it was still a natural decision. Julie didn’t make this choice on a whim. She took it very seriously, bringing in a consultant from Moet to help in making their first vintages and to learn the French methods for making sparkling wine. Karma. The majority of the grapes for the Karma sparkling wines come from their 14 acre estate vineyard on the South shore of Lake Chelan. The 2012 vintage will be 100% estate grown fruit. Prior to this year the percentages of estate grapes was typically in the 80% range. In 2011 the bears ate all the Chardonnay, otherwise they may have achieved 100% a vintage sooner. 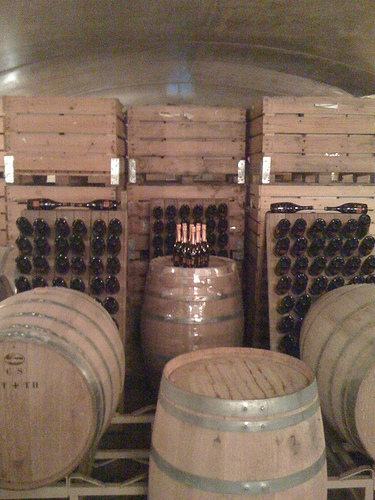 The sparkling wines are aged for three years and then undergo secondary fermentation in bottle in the Karma wine cave. During those three weeks the bottles are hand riddled, a process that is rarely followed due to the manual labor involved. Each bottle receives a quarter turn each day. At the end of three weeks, the sediment that has settled in the neck of the bottle is quick frozen and removed and then the final cork is applied. The wine cave is definitely one of the unique characteristics of the Karma vineyard. Julie wanted to build a facility that would fit into the surrounding area and have a limited impact on the environment. The cave seemed to fit as the contour of the land was suited for hosting a wine cave. It also helps Karma keep a low profile and blend into the vineyards and orchards that follow the Southern shore of Lake Chelan. Karma. Not only is the wine cave unique, it is also extremely environmentally friendly. It maintains a temperature close to 55 degrees year round and only requires moderate heating in the winter time. 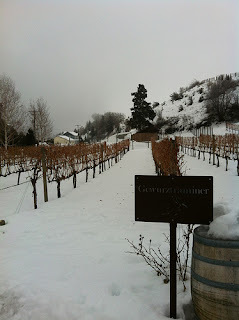 As you can see from some of the pictures the vineyard can be covered in snow during the winter months. 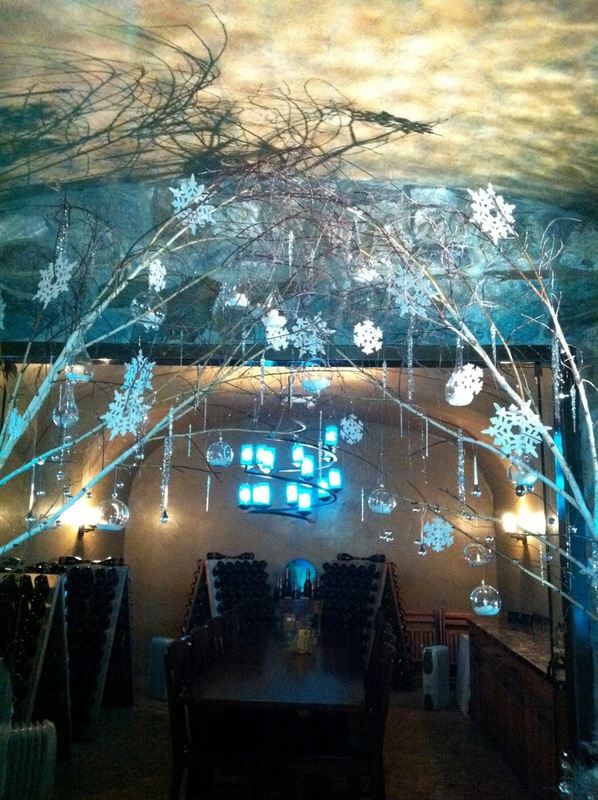 The wine cave has become one of the more popular parts of the Karma vineyard. 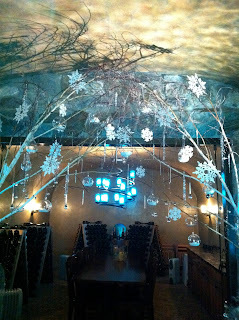 Weddings, concerts and other events are often hosted inside the wine cave. It also includes a private dining room for smaller intimate gatherings. During the spring, summer and fall you can also enjoy the outdoor patio and surrounding grounds. The entire area is beautiful and serene. It is a great place to relax after a day on the bike or the lake. The vineyard has become an extremely popular place for weddings. The first wedding was hosted in 2005 as a favor. Julie swore “never again.” Yet, here we are in 2013 and the vineyard will play host to 30 weddings! The decision to continue to host weddings after that first event in 2005 just seemed natural. Karma. If you enjoy the wines of Champagne and sparkling wines you should seek out Karma’s Methode Champenoise wines. Each vintage is released on Memorial Day weekend. They sell out quickly, so you might want to plan a trip to Lake Chelan to enjoy the new release over the three day weekend or soon after. Karma is certainly one more unique reason to visit this beautiful part of our state.